“Newk’s Legends” is a short-hand way to describe the week-long men-only tennis fantasy camp held once a year, for the past 24 years, at the John Newcombe Tennis Ranch in New Braunfels, Texas, north of San Antonio. The author, E.J. Kahn III, posted daily reports about his experiences at the camp in 2011 and his encounters with such Hall-of-Famers as John Newcombe, Roy Emerson, and Owen Davidson. His entertaining chronicle of the experience begins with Getting Ready For the “Zoo”. E.J. Kahn III—known to most as Terry—is an author, journalist, and, most recently, communications consultant. He has written Net Results with psychologist Jim Loehr, a book focused on junior tennis parenting and coaching, and co-authored the award-winning autobiography of New York police officer Steven MacDonald. As a consultant, he has worked in Washington and New York with—among others—the Postal Service, Colgate-Palmolive, the State Department, and the City of New York. He lives with his wife Lesley in Manhattan and is a member of the West Side Tennis Club in Forest Hills. 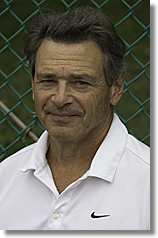 A former college lacrosse player, he first competed in USTA tournaments in 2009, when he was ranked 10th in the East and 67th nationally in the Men’s 60s. Steve, I had the pleasure to attend the Tennis Week with the Legends when Tony Roche, Roy Emerson, Fred Stolle, Ken Rosewall, Owen Davidson, Mel Anderson, John Newcombe, Charlie Passarel and other Legends were there. I was amazed and blessed to share the room with these great guys for 11 years. From this year’s blog on George Wachtel’s site, I could relive every day the past three years. Steve Contardi and his family always make this event very special for everyone. Most of the campers in those early days returned every year and especially I do miss my good friend Dr. Mike Lahan, who had passed away a few years back very unexpectactly. Without the great MIKE the event was not the same, when I returned after his unfortunate departure from this world. Dr. Al Eden is still a great inspiration for anybody who had the pleasure meeting him! I am devastated to learn that Terry is about to improve as both a racketeer and raconteur.